If you know a bit about breeds of pig, there’s a clue to the food offering at this restaurant in its name. Yes, this is the much-hyped homage to pork dreamt up by Allegra McEvedy and Tom Ward, a duo who worked closely together on fast-food chain Leon in years gone by; Allegra co-founded the company, while Tom was Operations Manager. The name Blackfoot references a breed of pig named after the colour of its hooves. If this restaurant were in Spain, it would be called pata negra, a phrase familiar from the labels of hams or on tapas bar menus, probably much more so than the English translation. We’re not sure if this is the point, but it is an interesting one all the same: in Spain, pork is taken very seriously indeed, whereas in this country it lingers well behind beef in the meat stakes (and, indeed, steaks). 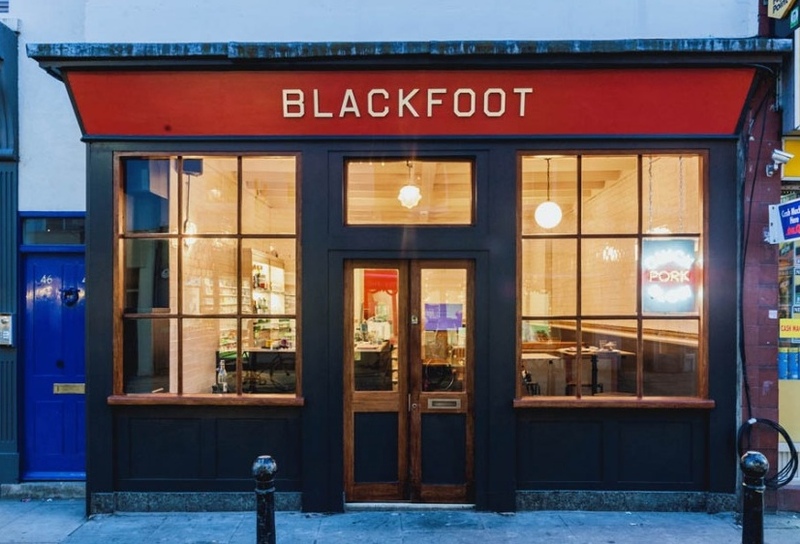 Set in a former eel, pie and mash shop on Exmouth Market, the buzzy atmosphere of the restaurant-dominated street carries into the café-style space where close tables, some at-bar seating and a steamed-up windowed front lends a cosy tapas bar vibe. Maybe it should have been called pata negra, after all. There are more Spanish nods to be seen in the selection of small plates made for sharing, which arrive when they’re ready, and head chef James Knight comes from a role at Soho tapas bar Copita. But the menu refuses to be tied down. 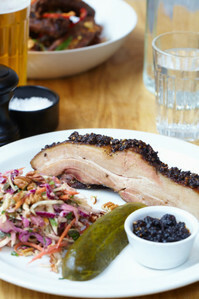 There is Vietnamese pork belly salad, Deep South-style ribs, Mexican pork tacos and oh so French rillette. What holds them all together is their main ingredient: pork. A plate of Gloucestershire-made fennel salami (£4) is pleasingly soft and fresh tasting, less firm and salty than its European counterparts. Served at room temperature, the fat within it has begun to melt lending an unctuous mouthfeel. There’s no shortage of fat in our whipped lardo on toast (£4), either. Made from pork juices and churned to resemble a very soft butter, it’s effectively bread and dripping and is brilliantly reminiscent of wiping out a baking tray with a slice of granary. A final small plate of fennel, almond and orange salad (£4.50) is a pleasingly crisp and fresh tablemate, though doesn’t quite live up to its cut-through-the-fat potential. It’s vibrant and healthy (like something we’d have bought from Leon) but craves a little more vinegar or citrus. A main-sized plate entitled ‘the long smoke’ (£15) sees a whole pork belly smoked and encrusted with Szechuan pepper, black treacle and star anise. If the flavour was a member of the pig family, it would be a walloping great bore, so powerful and mouth-tingling is the dark black crust. The accompanying slaw and pickles fight back to pleasing effect, though our palates (or wine) don’t stand a chance. We might suggest some subtlety, but actually we quite enjoy its brash, bold affront. We’re glad we tried some of the Iberico Presa (£25) first, though. A richly-marbled cut from the pig’s shoulder, it’s served daringly pink and is almost silken in its soft, smooth texture while rich and earthy in its taste. It’s the fillet steak of the pig world, and if you didn’t know what you were getting you’d be forgiven for not reckoning it was pork at all. It’s the most expensive dish on the menu by quite a long way, but it’s a treat worth trying if you fancy seeing pork in a new light. If you’re not feeling like pigging out on piggy, there’s a fish-of-the-day option and even a veggie-friendly nut burger. And stopping short of gimmicks like bacon jam roly-polys, desserts are also pork free. A large and indulgent (if slightly flat) chocolate eclair does exactly what it says on the tin, while a superbly light and fluffy slice of ‘like a key-lime pie’ is the star of the final course: zesty, bright and refreshing, it’s the perfect cleanser for a porky palate. Short selections of wines, beers, ciders and simple cocktails add up to create a flexible if tame drinks list that knows its place in the porking order. You could absolutely pop by for a sip and a small plate, but if you fancy a sample without going whole hog, we’d recommend you try a lunchtime porchetta and salsa verde roll to take away instead. We’ve heard very good things about them indeed. Blackfoot is at 46 Exmouth Market, EC1R 4QE.